Back in 2014, while I was on my Hubert H. Humphrey Fellowship at the Pennsylvania State University, my apartment in Cunningham Hall was the place where the Humphrey Fellows met every week. There we talked about serious and less serious matters, we laughed a lot and cried a little, and we dreamed big and small. One of our dreams was to write a research paper and have it published by a renowned publishing company. And yesterday my dream arrived per mail! A paper that I co-wrote with my colleague and best friend Bart Verswijvel, was published by Routledge. Bart and I were invited to contribute to the book International Handbook of Teacher Quality and Policy by Dr. Gerard LeTendre and Dr. Motoko Akiba. I've written 334 blog posts, received 371 comments, my blog has been visited 134,121 times, I have 58 followers, most of my readers come from the US. 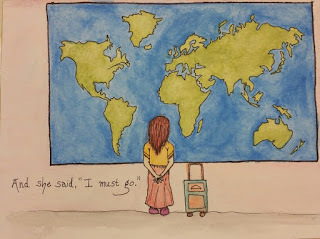 I've written about traveling quite a lot, both as a tourist and as a teacher traveling for educational purposes (conferences, school exchange visits, etc.) and also about teaching with technology. I don't know how many miles I've traveled, maybe there's an app for that! My most visited post is First lesson, new students and no computers, followed by Tech Tools To Boost Verbal Thinking. My least visited post, with only one view is Easter Sunday in Galway (I still think it's a well-written post about a beautiful Irish city). 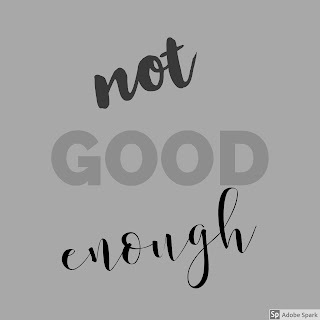 When you work hard, you work and work and all it results in is failure after failure, and you look back and try to improve and make it better and work again and work and work and nothing but failure comes out of all this hard work, how do you get up and keep going? How do you gain the strength to overcome your failures? Where do you find determination not to give up? How much grit does it take to succeed? How do you know that there is success at the end of the tunnel filled with failures? What if success happens to other people, what if it will never come to you, no matter how hard you work? How do you know when the time is right to turn over a new leaf? How do you know when to stop following your dreams? How do you know that your dreams are too big to fulfill? 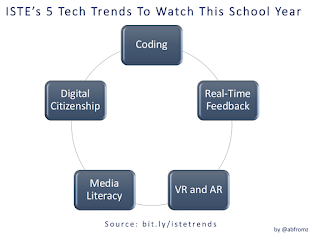 Check out the full article by ISTE Connects here: 5 Tech Trends To Watch This School Year. Lumen5 is an amazing user-friendly app that turns a blog post or an article into a video! 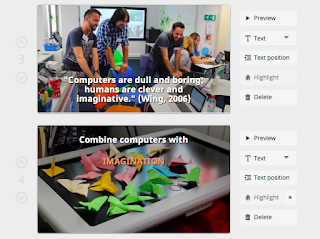 All you have to do is copy paste the link to the blog post and Lumen5's Artificial Intelligence will automatically create a storyboard for the video. If you don't like how "Natural Processing Algorithms" have shaped up your story, you can easily edit it any way you want. The next step that AI performs is choosing the appropriate audiovisuals from a huge library of copyright free videos, photos and audio clips. If you're not happy with AI's choices, no problem, because you can upload your own visuals. Before you publish the video you can add your logo and your watermark if you want to. The video can be published directly on Facebook or it can be downloaded as an mp4. file. Here's my first video that I created very quickly, it took me about half an hour to turn one of my blog posts into a video in the way I liked it. It's been a huge honor and privilege for me to serve on the Expert Panel of the NMC/CoSN Horizon Report for two years in a row and to examine applications and manifestations of trends, challenges and technology developments. 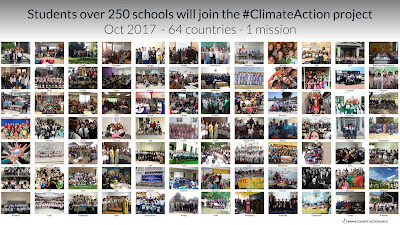 This year, the Panel was composed of 61 education and technology experts representing 20 countries across 6 continents. The Report can be downloaded here. The NMC/CoSN Horizon Report: 2017 K-12 Edition was produced by the New Media Consortium in collaboration with the Consortium for School Networking and made possible by mindSpark Learning. The expert panel examined an extensive set of background materials that identified and documented a range of existing technologies and proposed new topics and technologies that are relevant for teaching, learning and creative inquiry in K-12 education. The final topics selected by the panel are detailed in the Report.